Friends, I hope all goes well as we lean into the future. My daughter just started school so I know something is in the air of change. Teenage terrorism 101loving it! The Surf Musos fuel up after the "board meeting". 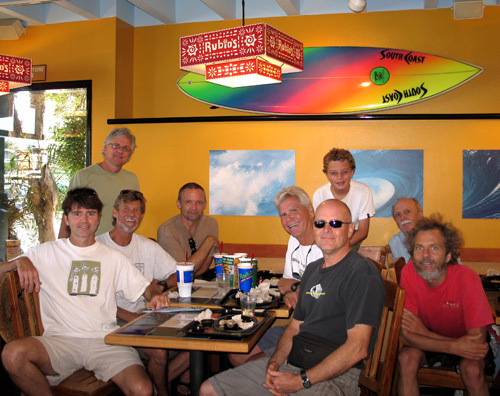 From the left, Toby Ahrens, Tripp, Gunnar, George Svboda, Bob Magnusson, Bill Shreeve, Sam Sprague, Hall Sprague, and Peter. 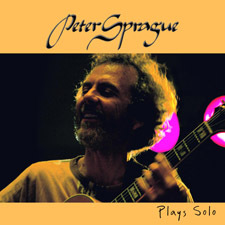 A guitar friend from the East Coast just alerted me about a good review of my Peter Sprague Plays Solo recording in this month’s Just Jazz Guitar Magazine. If you want check it out go here and then click on the topmost left review title. If you want to scope the recording itself, it lives here. Peter navigating the mic stands. 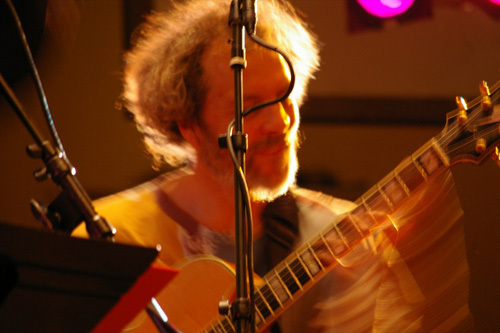 For this week’s music I’m heading to the Roxy on Thursday night. Vocalist Kevyn Lettau is in town on that day for a photo shoot (for our upcoming duo CD) and so she’s going to join me for the music. Just like the old days, before she up and got famous and moved to L.A., she played many times with us at the Roxy and the absurdness of ice cream, falafels, and jazz weirdly makes perfect sense in Encinitas. It’s one of the eighth wonders of the world. Hope to see you there. Kevyn hanging at the Roxy back in 1986. And this week ends with another one of our cool library gigs with Gunnar on bass and the Trippster on sax and flute. This time we’ll be playing the library in Poway on Sunday afternoon and if you’re into it, look below for the details. That’s the story and thanks for checking in. 7 PM Playing at North County's Transcendental Factory.